Fingernail ridges can be merely due to genetics, but they can also indicate certain underlying problems. Figure out its causes and find proper treatments! When you look at your fingernails, you may be able to make out raised lines running either vertically (aligned with your fingers) or horizontally (across your nails). Sometimes, especially when these ridges are very defined and apparent, they can cause your fingernails to look abnormal. 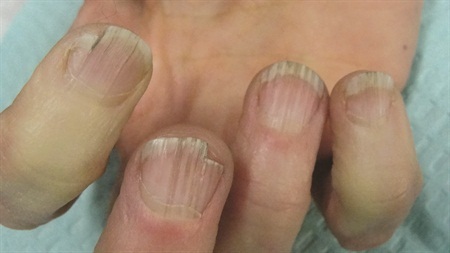 Vertical ridges are often considered to be a simple genetic attribute to one’s fingernails and do not always require alarm or treatment. While horizontal lines should be taken more seriously as they are a direct indication of underlying medical conditions. Malnutrition. Think about your usual diet. What foods are you eating regularly? What foods are missing from your meals? Certain foods like lean meats, fresh vegetables and whole fruits contain essential vitamins and nutrients that your body needs to stay healthy and nourished. If you have deficiencies in protein, iron, calcium or vitamins A or B then this can trigger abnormal ridges in your nails. Malabsorption. Sometimes our bodies may inadvertently work against us. If you are taking care to eat plenty of protein, calcium and vitamin rich foods, but your fingernails are still displaying deep ridges it could mean that your body is having nutrient absorption issues. If this is the case, it is important to consult a doctor to find out what is going on. It’s important to find out what exactly is causing your malabsorption because you may need medical treatments or daily prescriptions to help resolve the issue at hand. Loss of Moisture. Your age also directly affects the appearance of your nails. As you age, your nails begin to lose their moisture which directly causes fingernail ridges. The aging process always seems to have a negative effect on your nails, pulling away moisture rather than providing it. The skin dehydrates more easily causing the nail beds to lose natural oils that are meant to keep the nails smooth. A diet lacking in essential nutrients can and will disrupt the process of keratin formation in your nails and can cause horizontal lines. This, along with insufficient moisture, creates nail ridges and can make nails very brittle and prone to breakage. Horizontal ridges are also caused by various respiratory diseases, autoimmune diseases, skin disorders and exposure to harsh toxins. Beau’s Lines are characterized by deep, linear grooves and cells that have been darkened underneath the nail. These lines are indicative of various kinds of trauma, chemotherapy, malnutrition, acute illnesses, and metabolic problems. All of these conditions cause interruptions in the protein synthesis by the nail. Muehrcke Lines happen when there is an interruption in nail pigmentation. Kidney and liver disease, malnutrition and chemotherapy are directly linked to causing these kinds of horizontal lines on the nails. Transverse Ridges are indicative of a history of severe illness in someone. If you have suffered consistent threatening diseases or suffer from a terminal illness, such as cancer, these ridges will appear on your nails. Aldrich Mee's Lines appear as discolored lines across the nails. Arsenic poisoning or poisoning from other heavy, toxic materials cause these lines to appear. Terry' Nails are characterized by having a white nail plate. Someone with Terry’ nails will also have a horizontal band at the tip of the nail. Those suffering from diabetes, HIV, kidney disorders or liver disease will have Terry’ nails. Your diet is a major player in how healthy your skin and nails are. Balanced Diet. Maintaining a balanced diet that includes fruits and vegetables on a daily basis is most important for curing, preventing or relieving fingernail ridges. Omega-3 fatty acids like the ones found in fish and nuts will also be key to helping with ridges. Healthy Foods. Avoid nutrient-poor processed and prepackaged junk foods - the consequences go way beyond fingernail ridges! If you are craving sugars or junk food, buy fresher or healthier ingredients to make it yourself at home. Water Intake. Also be sure you are taking in a lot of water each day. This will improve your overall health, by supporting the organs and helping with waste elimination. Nutritional Supplements. You can consume supplements containing B12, zinc and iron which are associated with nutritional deficiencies that cause fingernail problems. Cleaning and Moisturizing. Keep your nails clean to avoid the growth of fungus, and keep hands and cuticles well moisturized. Using jojoba oil is one way to maintain moisture. Also apply hydrating lotions or creams any time when your nails are dry or before going to bed. Wearing Gloves. If you are doing work around the house and are coming in contact with detergents and other cleaning supplies, be sure to wear gloves so that your nails do not come in direct contact with these items. Careful Manicure. Filing or buffing your nails gently with an emery board can help smooth out fingernail ridges, but be careful not to buff too harshly. Treating Injuries. A nail injury such as closing a finger in a door or breaking the nail off of the nail bed can cause nail ridges if you do not take care of the nail as it grows back. Trauma like that causes direct damage to the nail bed that requires treatment for healthy nail recovery. Many health issues, like high blood pressure, and diseases, like diabetes, liver failure or cancer, can also cause fingernail ridges. Diagnosing the problems or causes of your fingernail ridges and following up with proper treatment is always the best approach to relieving the problem. Remember that in more serious cases you may need to consult with a doctor. Is Jamberry Nail Safe to Use?